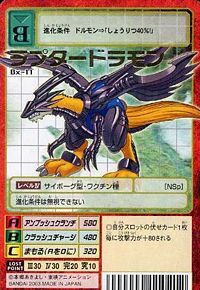 A Cyborg Digimon that transformed itself from a wild Digimon that possessed a predatory instinct into a basis for modifications, in order to reliably bring down its targets. Because the ferocious nature it possesses is too strong for its organic body to bear, it remodeled them with their corresponding weight in pure Chrome Digizoid metal, restraining their capacity for movement. However, whether it has high power output and flying ability or not is due largely to the organic body of the wild Digimon, before it was modified. Although it's small, if it gradually releases those abilities, it has the capability to easily bring down even a massive Digimon in a single blow. Signature Move: An assault that capitalizes on the sharpness of its Chrome Digizoid metal armor (Crash Charge). Its Special Move is leaping upon the opponent and instantly biting and rending their vitals with its sharp teeth (Ambush Crunch). 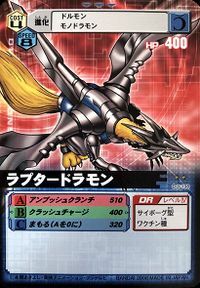 Because the ferocious nature it possesses is too strong for it to bear, it remodeled itself with heavyweight Chrome Digizoid metal, restraining its capacity for movement, but preserving its high power output and flying ability. Special Move: Leaps upon the opponent and bites its vitals with its sharp teeth (Ambush Crunch). n., A raptor 「ラプター Raputā」 is a type of dinosaur. 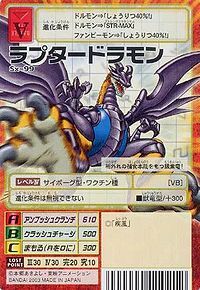 n., Short for Dragon 「ドラゴン Doragon」. He is one of two Adult forms for DORUmon and is Doumoto Kouta's partner. Can be evolved from Toy Agumon (Black). 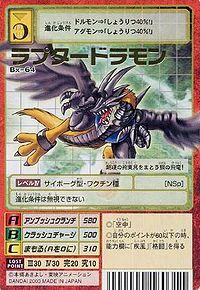 Raptordramon is #124 Digimon and is a Adult-level, Attacker-class, Dragon species with a resistance to the Fire element and weakness to the Earth element. Its basic stats are 162 HP, 170 MP, 114 Attack, 99 Defense, 63 Spirit, 83 Speed, and 40 Aptitude. It possesses the Ether Eddy 3 and EX Damage 2 traits. It dwells in the Access Glacier. Raptordramon can jogress from Monodramon and Toy Agumon (Black) if the base Digimon is at least level 22, with 1800 Dragon EXP and 160 defense. Raptordramon can jogress into Metal Greymon with Tankmon, or into Black Megalo Growmon with Dark Tyranomon. 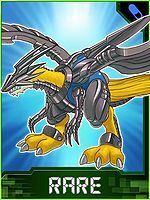 Raptordramon is a Adult-form Digimon with Vaccine Attribute and its Elemental Attribute is Steel, it is quick attacker, Cyborg type and family belongs to Nature Sprits, Metal Empire and Dragon's Roar. Raptordramon can evolve into Grademon at 25 level. In order to obtain the Raptordramon, you must at least buy in Cash Shop or exchange with Light and Vaccine attributes. It requires 10 Beast Chips. 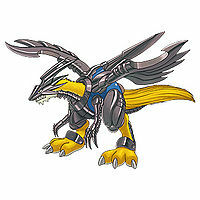 Raptordramon is available as a Digimon Medal. 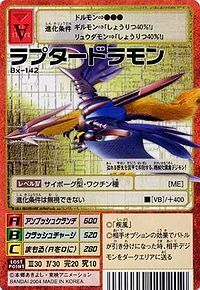 Raptordramon is available as a Digimon Card. Evolves from Agumon X-Antibody or DORUmon. Can evolve to DORUguremon, Grademon, Mega Seadramon X-Antibody, Metal Greymon X-Antibody, or Okuwamon X-Antibody. Evolves from DORUmon, Funbeemon, or Ryudamon. Can evolve to Cannonbeemon, Grademon, Hisyaryumon, or Metal Fantomon. Can also Jogress with Waspmon to evolve into Grademon. Can also Blast Evolve into Grademon or Alphamon. This raptor dragon possesses predatory instincts of a whole other level! This steel flying dragon is bound by super-hard restraints! This mechanized raptor Digimon's overflowing wild instincts are placed under control by its armor! ↑ Digimon Chronicle: "Dark Evolution"
This page was last modified on 12 April 2019, at 20:42.